The Highlands Ladybirds basketball team could not come up with another victory on the road Thursday. The host Cincinnati Ursuline Lions (2-0) handed Highlands (1-1) a 58-45 setback. Jesse Daley led the Ladybirds with 10 points and five rebounds. Ursuline led 32-20 at halftime building the lead behind offensive rebounds. Junior Sarah Reilly led the Lions with 14 points and 11 rebounds. Highlands travels to Louisville Sacred Heart on Tuesday at 7:30 p.m.
Photo by Edward Moorhead. 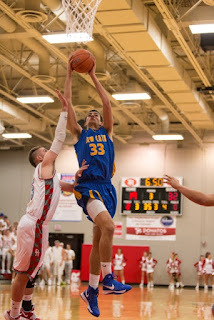 Newport Central Catholic center Jake Schulte (33) goes up for a shot in Wednesday's game at Dixie Heights. Schulte scored 11 points as NewCath held off Dixie Heights, 65-63 for its second win in as many days to start the season. EDGEWOOD – It never feels like any lead is safe when your opponent is junior Brandon Hatton. The Newport Central Catholic Thoroughbreds basketball team found that out Wednesday. NewCath built a double-digit lead and had to fend off a furious rally by Hatton and the Dixie Heights Colonels in a 65-63 victory. But the Thoroughbreds will take it. NewCath (2-0) won its second game in as many nights for just the second time over the Colonels (0-1) since Grant Brannen took over as head coach seven years ago. The Thoroughbreds lost to the Colonels the previous two years to open the season. The two teams met in the epic 2011 9th Region title game. Dixie Heights won it, 79-76 in quadruple-overtime. NewCath led 57-41 with 5:41 left in the final stanza. But Hatton scored six straight points on his way to a 22-point second half to lead the Colonel rally. The 6-foor-3-inch junior finished with 32 points. NewCath senior forward Nick Seibert guarded Hatton the entire game. The Thoroughbreds threw an extra player at him in the second half. But Hatton still knocked down shots. Hatton finished with seven three-pointers. But NewCath had better balance with three players in double-digits. Senior guard Michael Bueter led the way with 23 points with posts Drew McDonald and Jake Schulte adding 19 and 11 points respectively. Schulte had a dunk on a nice lob from Zach Pangallo with 3:23 left in the third quarter. It was the inside game that helped the Thoroughbreds build a double-digit advantage. NewCath led 14-7 after the first quarter, 32-17 at halftime and 50-36 entering the final stanza. Hatton scored nine points in Dixie’s 14-2 run that cut the margin to 59-55 with 2:12 left in the game. But the Thoroughbreds made all six free throws down the stretch to win the game. Bueter made all four attempts and McDonald hit the other two. Overall, Dixie Heights made eight three-pointers to two for NewCath. Bueter made both triples for NewCath. The Thoroughbreds do not play again until Tuesday in another big 9th Region showdown at 7:30 p.m. NewCath takes on the host Cooper Jaguars (1-0) in a battle between the two 9th Region preseason favorites. Photo by Steve Cornelius. Newport Central Catholic quarterback Josh Cain (2) looks for yardage while teammate Dan Ruwe (21) blocks Somerset's Tanner Gadberry (6) in the Class 2A state semifinals on Friday. The District 6 champion Thoroughbreds (10-4) take on District 1 champion Caldwell County (11-3) for the state championship Saturday at Noon at Western Kentucky University. The Newport Central Catholic Thoroughbreds football team finds itself back where it likes to be on a yearly basis. That is playing for a state championship. NewCath is playing on the final weekend of the season for the second time in three years since Eddie Eviston took over as head coach in 2010 and eighth time since 2000. NewCath will take on an unfamiliar opponent in the District 1 champion Caldwell County Tigers (11-3) from western Kentucky. Game time is Noon Eastern Standard Time at Western Kentucky University’s Houchens/L.T. Smith Stadium in Bowling Green. The two teams have never met on the gridiron. The Thoroughbreds (10-4) earned the trip with a 27-18 Class 2A semifinal win at Somerset. That marked their closest call in the playoffs. NewCath trailed 12-7 in the third quarter before going ahead for good. They’ve won eight in a row and earned their 12th double-digit win season since 2000 in the process. NewCath moved to 9-0 against teams in Classes 1A and 2A this season having outscored all four playoff opponents 177-45. The two teams have some history playing in state championships. The Thoroughbreds have won four state championships and finished runner-up six other times. The Tigers won two 2A state championships in 1998, 38-28 over Danville and 1963 over Highlands, 14-7. The battles along the offensive and defensive lines could go a long way in this game. The Thoroughbreds have dominated both lately. They had to grind out every yard in the win at Somerset. The Tigers have outscored opponents, 566-293 compared to 534-222 for NewCath. Both teams run balanced, spread offenses. Caldwell County has rushed for 2,706 yards and passed for 2,723. NewCath has run for 2,421 yards and passed for 2,182. Defensively, teams have run for 2,977 yards against the Tigers and passed for 1,497. Opponents have run for 1,908 yards and passed for 1,795 against the Thoroughbreds. The NewCath 4-4 defense will face one of the top rushers in the state in Caldwell County sophomore Jaylen Boyd. Boyd has rushed for 1,949 yards on 225 attempts and 29 touchdowns for an average of about 8.7 a carry. Tiger sophomore quarterback Elijah Sindelar has completed 182-of-298 passes for 2,703 yards, 30 touchdowns and six interceptions. Caldwell County’s leading receiver is senior Martez Sivils with 85 catches for 1,295 yards and 15 touchdowns. Defensively for NewCath, junior linebacker Jack Sutkamp leads NewCath with 102 tackles. Mac Franzen leads the Thoroughbreds with three interceptions with Pete Collopy, Tyler Lyon and Mason Myers recording two fumble recoveries each. Lyon recovered one fumble in the end zone for a touchdown in the Region 3 title game against Walton-Verona. The Thoroughbreds will counter offensively with their three main weapons with a mixture of other contributors. Senior Dylan Hayes leads NewCath with 1,601 yards rushing on 206 carries and 26 touchdowns for an average of about 7.8 a carry. NewCath quarterback Josh Cain has completed 153-of-253 passes for 2,181 yards, 18 touchdowns and seven interceptions. Franzen leads the Thoroughbred receivers with 55 catches for 1,062 yards and seven touchdowns. The Thoroughbreds have done well on special teams for the most part. Hayes and freshman Jacob Smith have returned kickoffs and punts for touchdowns this year. Nathan Grosser and John Caudill have done a lot of kicking off and extra-point attempts for NewCath this year. One thing that could benefit NewCath is a tougher schedule. The Thoroughbreds faced three Class 6A opponents, a 4A opponent and one opponent from Ohio’s third-largest Division III. One of those opponents in Simon Kenton advanced to the third round of the 6A playoffs. Caldwell County has faced one opponent that catches attention in western Kentucky. Class 1A power Mayfield handed the Tigers a 48-7 defeat on Oct. 26. Mayfield is playing Fairview for the 1A title on Friday. The Tigers played four opponents in larger classes, but none finished with winning records. Caldwell County finished 2-2 against those opponents beating 5A Ohio County (56-20) and 2011 Class 4A runner-up Franklin-Simpson (49-13) and losing to 4A Calloway County (34-31) and 3A Trigg County (38-37). 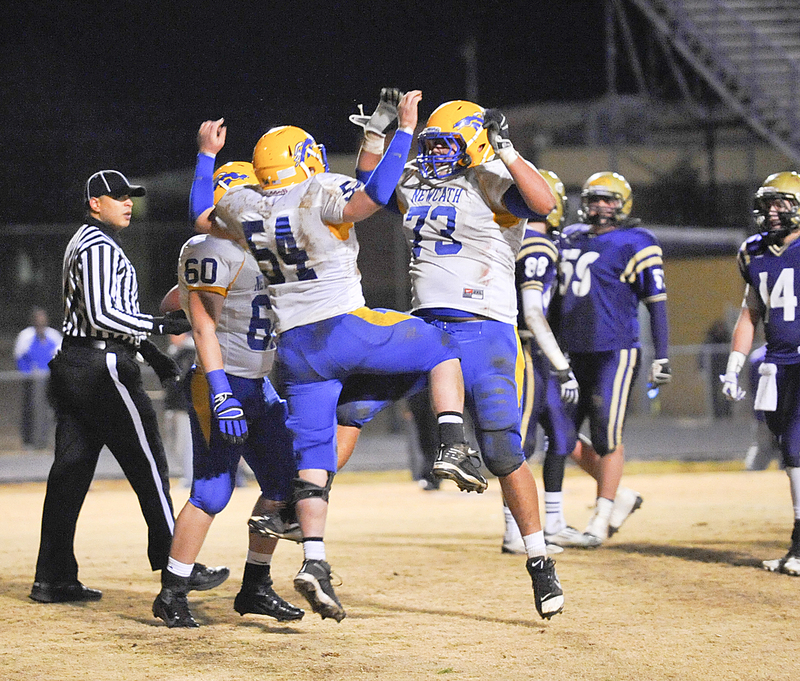 Caldwell County earned its way into the title game with a 43-31 win over Louisville DeSales. The Tigers led 30-7 at one point before DeSales cut it to nine at one point. Boyd rushed for 288 yards and four touchdowns in the win for the Tigers. The Tigers had to beat district rival Murray to earn their way into the state semifinals. They squeaked by Murray, 10-7 in the Region 1 title game after winning the regular-season matchup, 24-21. Photo by G. Michael Graham/Fort Thomas Matters. 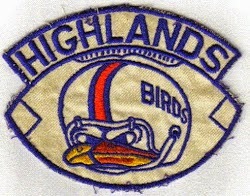 The 2012 Highlands Bluebirds football team will be looking to add to the legacy on Friday against the Collins Titans. Game time is 8 p.m. EST at Western Kentucky University's Houchens/L.T. Smith Stadium in Bowling Green. It was not until recently that the Highlands Bluebirds football team heard about the Collins Titans. That’s because the Titans (11-3) broke off from Shelby County in 2010. Collins is the last team standing in the way of history for Highlands. Class 4A’s top-ranked Bluebirds (13-1) will take the field in search of a Kentucky record sixth consecutive state championship Friday at 8 p.m. Eastern Standard Time at Western Kentucky University’s Houchens/L.T. Smith Stadium in Bowling Green. A win would give Highlands its 22nd state championship overall. The Bluebirds enter the game with an overall record of 841-225-26 since starting their program in 1915. That win total is good for second in the country behind just Valdosta (Ga.) with 876 victories since 1913. Collins is 33-8 in its brief three-year history with three district championships. The Titans have advanced one round deeper into the playoffs each year having faced Louisville Western in three consecutive Region 2 championships. The Titans lost to the Warriors in 2010 by a 31-26 count before edging Western, 13-12 last year and 36-20 this year. Head Coach Jerry Lucas has led the building process for the Titans. Collins lost to 2011 runner-up Franklin-Simpson, 20-15 in the state semifinals last year. But the Titans came back to beat undefeated and third-ranked Warren East, 58-7 in the semifinals Friday. Aside from history, depth could factor into this contest. The Bluebirds dress more than 90 players and have no one playing on both offense and defense while the Titans dress about 50 and have several players going both directions. Highlands tends to wear down teams that have players going both ways. Highlands also played the tougher schedule having to go through ranked Ashland Blazer, Covington Catholic and Lexington Catholic to get to this point. The only ranked team Collins faced on its way to the state championship was Warren East. The first five Highlands opponents made it to the third round of the playoffs. One made it to the 6A state semifinals in Scott County, where it fell 21-14 to Louisville Trinity in the last minute. Collins finished 2-2 6A competition in the regular season beating 7-5 Meade County (21-14) and 5-7 Oldham County (28-14) and losing to 11-3 6A semifinalist Louisville Eastern (41-29) and 6-5 Lexington Bryan Station (55-52). Aside from Louisville Western, the other common opponent is Boyle County. The Rebels beat the Titans, 49-26 in Danville eight days after Highlands rallied past Boyle County, 52-31 on Aug. 17 to open the season. Junior quarterback Lawson Page completed 14-of-18 passes for 260 yards and two touchdowns against Warren East. Like Highlands senior quarterback Donovan McCoy, Page wears number one and is a dual-threat out of Collins’ spread offense that mixes in some Power-I formations. Page has completed 185-of-346 passes for 2,825 yards, 36 touchdowns and nine interceptions. Page has also run the ball 155 times for 730 yards and five touchdowns for an average of 4.7 a carry. Junior running back Deandre Farris is a threat to catch and run the ball. He leads the Titans with 128 rushes for 937 yards and 17 touchdowns for an average of 7.32 per carry. Farris also has 60 catches for 974 yards and 13 touchdowns. Junior wide receiver Nathan Sames leads Collins with 62 catches for 994 yards and 16 touchdowns. Collins has outscored the opposition, 562-349 for an average of about 40.1-25 a contest. Highlands has outscored its 14 opponents, 734-272 for an average of about 52.4-19.4. Collins has rushed for 2,681 yards and passed for 2,825. The Bluebirds play a 3-4 scheme defensively. They’ve allowed 2,584 yards rushing and 1,272 passing. Senior Quentin Murray leads Highlands with five interceptions and brother Brady Murray, a sophomore linebacker, leads the way with two fumble recoveries. Reid Schroeder leads Highlands with eight tackles for a loss. Thomas Wrobleski leads the Bluebirds with 7.5 sacks and 6.5 tackles for a loss. Seth Hope follows with 6.5 sacks. The Highlands offense has rushed for 3,696 yards and passed for 3,252 more. The Bluebirds have also scored 104 touchdowns this year. McCoy leads the way with 1,039 yards rushing on 148 carries and 20 touchdowns for an average of about seven a carry. McCoy has also completed 159-of-252 passes for 2,616 yards, 30 touchdowns and 11 interceptions. Five Bluebirds have rushed for at least 430 yards. Junior Zach Harris follows McCoy with 130 carries for 905 yards and 18 touchdowns for an average of about seven a carry. Highlands has 12 wide receivers with at least nine catches. Senior Luke Turner leads the way with 38 receptions for 795 yards and seven touchdowns. Junior Luke Brockett has 21 catches for 358 yards and four touchdowns. The Bluebirds catch the ball all over the field making life tough for defenses. The Bluebirds have won the state championship in 10-of-12 appearances in the title game since Mueller came on staff in 1994. The only years they finished runner-up were 1995 losing 28-12 to Bowling Green and 2003 falling 44-10 to Boyle County. Photo by G. Michael Graham. Highlands senior Leah Schaefer (23) fires up a free throw in Tuesday's game against Dixie Heights. She made it for the 1,000th point of her career. Schaefer scored 14 points as Highlands opened with a 64-30 win over Dixie Heights. Schaefer became the 13th player in school history to reach 1,000 points in her career. Highlands Ladybirds basketball head coach Jaime Walz-Richey and staff would love to see this remain consistent the entire season. All 12 players who saw action contributed in host Highlands’ 64-30 win over the Dixie Heights Lady Colonels on Tuesday. This marked the season-opener for both teams. Nine different Ladybirds scored. But senior forward Leah Schaefer hit a scoring milestone with at least two predecessors watching. With 5:19 remaining in the third quarter, Schaefer drew a foul and hit two free throws to score her 1,000 career point. Schaefer came into the season needing 14 points to become the 13th player in Highlands history to hit the plateau. Those 14 points marked the game-high for both teams. Schaefer added five rebounds. Richey hit 1,000 points as an eighth-grader on her way to the state-record 4,948 points. Dixie head coach and former Highlands standout Tara Boothe-Smith also hit the plateau before going to Xavier and setting Xavier records for career points with 2,324 and rebounds with 1,004. Smith is in her second year as head coach of the Lady Colonels after serving as an assistant at Highlands. The guard play turned out to be the difference in this game. Dixie Heights turned the ball over 25 times and only took 22 two-point attempts. Highlands turned a number of those turnovers into steals and points. Schaefer led Highlands with four steals with Ava Abner and Alex Combs recording three each. The Ladybirds constantly pressured the ball all over the court doubling the guards at certain locations. Highlands made eight three-pointers and 14-of-17 free throws for 82 percent. Dixie Heights hit three triples and just 3-of-7 free throws for about 43 percent. After Schaefer, one other player for both teams made double-figures. Senior guard Vanessa Fisse made three three-pointers and two free-throws for 11 points. Jesse Daley and Alex Combs followed with eight each for Highlands. Combs made two triples with Brianna Adler, Tomi Blanton and Lydia Graves added one three-pointer a piece. Highlands scored the game’s first eight points and never looked back. Richey credited Daley for two buckets in the post there because Dixie Heights started to double the paint after that point. The Ladybirds used a 12-0 run to pull away and lead 27-9 after the first quarter. Adler and Graves made three-pointers during the run. Highlands extended the lead to 38-10 at halftime. The Ladybirds would have shut out the Lady Colonels in the second quarter if Molly Diamon had not drawn a foul as time expired and made 1-of-2 free throws for Dixie Heights. Highlands won the second half, 26-20. The Ladybirds made five three-pointers in the fourth quarter. Liza Tibbs, a 6-2 sophomore, led Dixie Heights with nine points. She scored five in the fourth quarter, but did battle foul trouble the entire game. Dixie Heights finished 10-22 in Smith’s first season. The Lady Colonels lost 72-38 to Ryle in the 9th quarterfinals in their first appearance in the regional tournament since 2008. Dixie Heights last won region in 1992. Highlands travels to Cincinnati Ursuline on Thursday at 7:30 p.m. The Newport Central Catholic Thoroughbreds opened the season with a convincing 69-46 win at Ludlow on Tuesday. The Thoroughbreds face another District 34 team Wednesday at 7:30 p.m. They travel to battle the Dixie Heights Colonels. It will be the season-opener for Dixie Heights. It’s been a case of being close, but not quite over the mountain. The Newport Central Catholic Thoroughbreds basketball team has been to the 9th Region championship two consecutive years, but has not been able to nab its first crown since 2000. The Thoroughbreds fell 54-49 to Boone County last year and 79-76 in quadruple-overtime to Dixie Heights in 2011. The Highlands Bluebirds defense wanted to contain Lexington Catholic wide receiver David Bouvier in Friday’s state semifinal contest. The Bluebirds accomplished the feat in the 61-28 victory. Bouvier had just three catches for 41 yards. His longest catch went for 18 yards. Bouvier came into the game with 83 catches for 1,240 yards and six touchdowns. Bouvier had eight catches for 130 yards in LexCath’s 27-16 semifinal win over Boyle County. When you think the Highlands Bluebirds football team will not do something, Class 4A’s top-ranked squad proves you wrong. The Bluebirds (13-1) came into Friday’s state semifinal matchup against the fourth-ranked Lexington Catholic Knights as favorites. But few expected them to beat the Knights worse than last year’s record-setting squad and eclipse their season averages of points, touchdowns and offensive output. But the Bluebirds did just that in a convincing 61-28 win over LexCath (11-3) on Friday at David Cecil Memorial Stadium for their 29th consecutive playoff win. Highlands moved to 13-1 overall, including an 86-3 mark since the start of 2007. Photo by Steve Cornelius. Newport Central Catholic senior Brady Thacker (54) celebrates his fourth-quarter 3-yard touchdown with teammates Elliot Rust (73) and Colin Hoover (60) at Somerset on Friday. The Thoughbreds beat the Briar Jumpers, 27-18 to advance to their eighth state championship game since 2000. SOMERSET – Thanks to the arm of quarterback Josh Cain and the legs of running back Dylan Hayes, the Newport Central Catholic Thoroughbreds (10-4) punched their tickets to Bowling Green for the Class 2A State Championship game. With a 27-18 victory over the Somerset Briar Jumpers (11-3) on Friday at Clark Field, the Thoroughbreds are headed to their second state championship game in three seasons, where they will square off against the Caldwell County Tigers (11-3) next Saturday at Noon at Western Kentucky University’s Houchens Industries-L.T. Smith Stadium. Caldwell County advanced to the championship with a 43-31 win over Louisville DeSales on Friday. This looks to be their biggest challenge of the Class 2A football playoffs. But the fourth-ranked Newport Central Catholic Thoroughbreds (9-4) do not mind. They travel near Lake Cumberland with history on their side. NewCath began its current run of 13 consecutive trips to the regional title game in 2000 and when the Thoroughbreds advanced past that round, they’ve ended up playing two extra games. NewCath (9-4) sports a perfect 7-0 record in state semifinal contests during that time. That includes wins in 2005 and 2006 against Friday’s opponent in the host and second-ranked Somerset Briar Jumpers (11-2) back when there were four classes. Game time is 7:30 p.m. at Clark Field. NewCath beat Somerset, 35-10 in Newport in 2005 and 40-24 in Somerset the next year in the Class A semifinals. The Thoroughbreds went on to beat Mayfield, 42-7 for the 2005 state championship and Danville, 37-34 for the 2006 title. The Highlands Bluebirds do not need to be told every football team in Class 4A is aiming for them. They’ve been in that position for years, especially with a state-record 21 state championships, including the previous five. Highlands (12-1) again puts its 28-game playoff winning streak on the line Friday against a team that could consistently challenge on a yearly basis. The fourth-ranked Lexington Catholic Knights (11-2) come to Fort Thomas in a rematch of last year’s state semifinal contest at 7 p.m. Highlands downed LexCath, 42-21 in Lexington before beating Franklin-Simpson, 42-14 in the Class 4A title game a week later. The Bluebirds beat the Covington Catholic Colonels, 28-13 in the Region 4 title game to make it to the semifinals. Down the road, LexCath rallied past Boyle County, 27-16 in the Region 3 championship. The Knights outgained the Rebels, 393-247 in total offense including 306-81 in the second half. It is a case of a youth movement. But that does not go for just the players, but also the head coach of the Newport Central Catholic Lady Breds basketball team. George Stoll, a 2006 NewCath graduate, enters his first season as head coach taking over for the retired Ron Dawn. Stoll has been on staff since 2009 when Dawn took over as head coach. Everyone knows the Highlands Bluebirds football team wears opponents down with its depth. The Bluebirds do not have any players going on both offense and defense. Only Covington Catholic and Cincinnati Elder matched the Bluebirds in that aspect so they’ve been able to challenge Highlands. Elder handed Highlands its lone loss, 38-24 on Oct. 19. The Colonels gave the Bluebirds two good games. But Highlands held off its biggest rival, 28-13 in the Class 4A, Region 4 Friday. Highlands head coach Dale Mueller said CovCath senior Sam Williamson is the lone player to go both ways on either team. Williamson is listed as a defensive lineman, but he plays a few plays on the offensive line. Some argue that the Northern Kentucky football rivalry between the Highlands Bluebirds and Covington Catholic Colonels is not really a rivalry anymore because it’s been one-sided since 2006. Despite that, the Colonels consistently threaten the supremacy of the top-ranked Bluebirds so Highlands prepares for them intensely. That preparation added up to a second consecutive Class 4A, Region 4 championship over the fifth-ranked Colonels, 28-13 at David Cecil Memorial Stadium on Friday. The Newport Central Catholic Thoroughbreds football team left a huge exclamation point on why it is the top Class 2A squad in Northern Kentucky. For the third consecutive playoff game, the Thoroughbreds (9-4) jumped out to a huge lead and cruised to victory. They scored 28 points in the first quarter against the Walton-Verona Bearcats (10-3) and never looked back in a 49-13 Region 3 championship win Friday. The fourth-ranked Throughbreds won their seventh consecutive game and snapped the Bearcats’ eight-game winning streak. They’ve outscored opponents, 345-50 during the winning streak, including 150-26 in the three playoff victories. Submitted Photo. 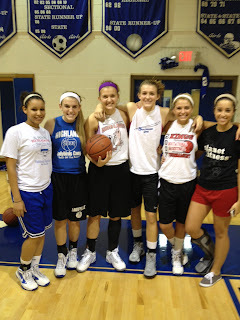 The Highlands Ladybirds basketball team has six seniors this year. They are, from left, Kelsey Clark, Emilie Parton, Jesse Daley, Leah Schaefer, Ava Abner and Vanessa Fisse. On Thursday, Schaefer signed to play at Xavier University in Cincinnati and Daley signed with NCAA Division III Thomas More College. On paper, this could be a special winter for the Highlands Ladybirds basketball team. Highlands returns a wealth of talent and experience from last year’s squad, including four starters. That has the Ladybirds listed as a contender in the 9th Region. The Northern Kentucky Girls Basketball Coaches ranked Highlands second in the region behind the Notre Dame Pandas in their annual preseason poll. While Highlands and Notre Dame did not suffer huge losses to graduation, the Ladybirds know the rest of the region will not bow down. They will have to prove themselves on a daily basis. The Highlands Bluebirds football team would not mind a repeat of last year in the 60th meeting against its arch-rivals. The Bluebirds took down the arch-rival Covington Catholic Colonels, 42-37 in the regular-season matchup before downing the Colonels again, 49-14 in the Region 4 title game on their way to a fifth consecutive state championship. They meet again for the Region 4 championship at 7 p.m. Friday back at David Cecil Memorial Stadium in Fort Thomas. Class 4A’s top-ranked Highlands (11-1) faces that task against CovCath (9-3) after both teams dominated their first two playoff opponents from District 8. Highlands won the District 7 opener for both teams, 35-21 on Sept. 21. It is fitting for the district champions to meet for the Class 2A, Region 3 football championship Friday at 7 p.m. at Newport Stadium. The host and fourth-ranked Newport Central Catholic Thoroughbreds (8-4) and Walton-Verona Bearcats (10-2) bring respectable records to the table thanks to nice winning streaks. The District 6 champion Thoroughbreds have won six straight since starting the year 1-3. The District 5 champion Bearcats have won eight in a row since starting the season 2-2. Both teams also run similar offenses and defenses. They like to run spread offenses that look like Wing-T formations as times and 4-4 defenses. They went into the second-round Class 2A football playoff game at Newport Stadium confident. But the Newport Central Catholic Thoroughbreds were not overconfident unlike last year’s playoff meeting with the arch-rival Covington Holy Cross Indians. The fourth-ranked Thoroughbreds had beaten the defending state champions, 49-10 on Oct. 18 at Scott in the regular season and did not want a repeat of last year. Photo by G. Michael Graham/Fort Thomas Matters. The Highlands Ladybirds Cross Country team captured its seventh state championship winning the Class AA crown Saturday at Horse Park with 65 points. LEXINGTON – The young and talented Highlands Cross Country teams hoped to begin their own run of greatness at the Class AA state cross country meet Saturday at Horse Park. The Ladybirds accomplished that by dethroning the four-time defending state champion South Oldham Lady Dragons and the Bluebirds finished sixth. Both won the Region 4 meet last weekend. The Ladybirds won their seventh overall title, but first since winning three in a row from 2002 to 2004. The Highlands Bluebirds defense knew the Ashland Blazer Tomcats would try to pound them between the tackles. The Tomcats finished with 260 yards on 52 carries and two touchdowns for an average of five a carry. But after going for 196 on 28 carries for an average of seven in the first half, Ashland managed just 64 yards on 24 carries for an average of about 2.7 a carry in the second half. Highlands pulled away from Ashland, 52-13 in the second round of the playoffs Friday. Ashland came into the game with three running backs out with injuries including freshman Quentin Baker. The Tomcats ran out of the tight I-formation packages and some spread looks. Quarterback Aaron Elam and running backs Evan Yongue and Malik Massey had most of the carries. The Highlands Bluebirds football team knew it had history on its side entering Friday’s second-round Class 4A playoff game. The Ashland Blazer Tomcats had not beaten the Bluebirds since 1954. Despite that, Ashland made a game of it trailing just 16-13 at halftime. But the top-ranked Bluebirds (11-1) gave the visiting Tomcats (9-3) no more hope of an upset in the second half outscoring them, 32-0 to pull away for a 52-13 victory at David Cecil Memorial Stadium. Highlands moved to 84-3 since the start of 2007. With their 27th consecutive playoff win, the Bluebirds earned another trip to the Region 4 championship. They will face the arch-rival Covington Catholic Colonels (9-3) back in Fort Thomas on Friday. CovCath downed host Johnson Central, 45-15 Friday in Paintsville. The Bluebirds beat the Colonels, 35-21 on Sept. 21, also in Fort Thomas. Runners from all over Kentucky hit Horse Park near Lexington for the state cross country championships. The Highlands Bluebirds and Ladybirds teams have good shots at state titles. They come into the meet with Class AA, Region 4 championships. It would mark the seventh for the Ladybirds and first since winning three in a row from 2002 to 2004. A state title would be the third for the Bluebirds and the first since 1985. Both teams have tapered off the workouts this week. That included two days off. Head Coach Brian Alessandro, a 1998 Highlands graduate, has employed that strategy personally before running marathons (26.2 miles) in places like Louisville and Houston. Alessandro and the runners did not seem concerned about the course at Horse Park. The course has some rolling hills. Highlands ran at Horse Park a few weeks ago winning the Lexington Catholic Meet. Alessandro said North Oldham and South Oldham will be the main challengers in both races. The South Oldham Lady Dragons have won the last four AA titles. They won Region 3. They’re top three runners in the region meet were sophomore Erin Wilson (fourth in 19:37.92), senior Grace Whitworth (fifth in 19:39.25) and junior Keightley Dudgeon (sixth in 19:56.31). The times of the three top Ladybirds came out lower than South Oldham’s top three. Freshman Molly Mearns won the Class AA, Region 4 meet in 18:36.9 with sisters Lauren Ossege, a freshman, and Sydney Ossege, an eighth-grader, comin in second and third at 18:40.4 and 19:10.7 respectively. When the Class 2A football brackets came out, the fourth-ranked Newport Central Catholic Thoroughbreds knew this was a possibility. The last two 2A champions will meet in the second round of the playoffs Saturday at 7 p.m. at Newport Stadium. In the first round Friday, the Thoroughbreds (7-4) took care of the Gallatin County Wildcats, 49-13. At the same time, Covington Holy Cross Indians (4-7) took care of host Owen County, 42-32 to set up another meeting between the rivals on opposite sides of the Licking River. The Thoroughbreds have won five in a row, including 49-10 over Holy Cross on Oct. 18 at Scott High in the anticipated rematch of the 2011 Region 3 title game. Holy Cross won that title game, 24-21 on its way to the state championship. That marked NewCath’s lone loss to a district opponent since 2006. But the teams have gone in different directions this season. Holy Cross finished third in district action behind NewCath and Lloyd Memorial and lost five in a row at one point during the regular season after going 12-3 last year. Photo by G. Michael Graham/Fort Thomas Matters. The top-ranked Highlands Bluebirds take on the eighth-ranked Ashland Blazer Tomcats in the second round of the Class 4A playoffs on Friday at 7:30 p.m. in Fort Thomas. Many have tried it this season. But only one football team successfully carried out the plan to victory against Class 4A’s top-ranked Highlands Bluebirds (10-1). Teams try to gain five yards at a time rushing the football between the tackles, milk the clock and keep the quick-strike Bluebird offense off the field. Cincinnati Elder did it in Highlands’ lone loss of the season, 38-24 on Oct. 19. But the Panthers are the lone team that has had a big enough offensive line and a bruising running back to pull off the feat.